A Simple Fall Look and a Giveaway! Hi Guys! Thanks for coming to my blog today! And it’s a giveaway day which is always fun. I looooove doing giveaways on my blog and I hope you guys love them too! So let’s talk about my look first because it’s the easiest thing to throw on ever. I’m sure you guys have noticed that since I gave birth to Riley, my fashion has really changed. I still like to get dressed up here and there, but for the most part my every day style is really casual and functional. It has to be when you’re chasing two young kids around. Well, Riley is not moving around quite yet but I am carrying him everywhere. And he’s a massive child! He’s in the 97th percentile for weight and he is off the charts for height. So this mama needs to be as comfortable as possible when carrying him around. Here’s the thing, I don’t want to be wearing a t-shirt and jeans every single day. Don’t get me wrong, I love a good t-shirt and jean combo but sometimes I just want to feel a bit more styled. But with little effort! So that’s what today’s blog post is all about! This is for anyone out there who wants to throw on a few items and feel styled. No fancy half tucks of the shirt or high heels. You just throw this on and automatically look cute, put together and comfortable! And the best part, the three main items in this look – the over-the-knee boots, white tunic and leggings – can be worn again and again and styled with different accessories. So they are well worth adding to your fall wardrobe. The most essential thing for me when styling a functional outfit is having comfortable footwear. I love certain high heels (they have to be comfy) but for the most part I’m wearing flats – like the boots I’m wearing in today’s post. These boots are incredible! They are the absolute best quality that you can get when it comes to boots. They are from Børn shoes and I can’t say enough good things about the brand. I have a couple pair of boots that I got from Børn last season when I worked on a campaign with them and they still look brand new this season even though I’ve worn them a ton over the last year. If you order a pair you’ll see for yourself. You can tell as soon as you open the box how well they are made. I also really love the width of the calf on these boots. If you have wide calves and are looking for knee-high boots that will fit you, these might be the ones! But because they’re made so well the wider calf also works great if you have smaller calves because they don’t fall down and are great to wear with thick, chunky socks. And I don’t know about you guys, but I always see other bloggers online wearing boots where it looks like the calf of the boot is wide because it’s wide on them and looks super cute and oversized (does that make sense?). Something about the boot not being super tight to your leg looks flattering. But I quickly realized after I ordered a few pairs that I saw on really thin bloggers, that their leg was just super skinny and it wasn’t necessarily that the boot had a wide calf. Ha! I can say pretty confidently that my legs aren’t that skinny. I know I post flattering pictures of myself here on my blog, but as you guys know from the bikini post I did recently, I’m not nearly as thin as I used to be and I’m totally OK with that. So hopefully that gives you a better idea of what these boots might look like on you. And if you love these boots you can get them (and anything on the Børn site) for 15% off with my code ALILUVSBORN3. The code is good until the end of November. Børn also has kids shoes! Heck yes for easy shopping all in one place! When I got my boots, I got a pair of shoes for Molly for school and a pair of shoes for little Riley! Obviously, he’s not walking yet so he doesn’t really own many pairs of shoes. Really he only owns two right now. This Born pair being one of them. I just thought they were so stinking cute when I saw them that I had to get them for him! And I don’t know, I guess I feel weird when we go out to restaurants and he doesn’t have shoes on. I get that he’s a baby but he’s at a point where he likes to put weight on his feet when I’m holding him and I don’t want his little feet exposed. And how stinking cute are his overalls! There is nothing cuter than a baby in overalls! They are a little big but he will grow into them. Probably by next week at the rate this kid is growing! Ha! I actually got Molly the exact same overalls in her size so stay tuned for some adorable matching photos of the two of them! And I got these boots for Molly because I think they’ll be super cute with knee-high socks and dresses this fall. Something about a brown boot on a little girl just melts my heart! Her dress in these photos is a little bit too big on her so it looks a little silly, but at least her boots are super cute! So now that we’ve got the shoes covered, the rest of my look is just a pair of leggings, a white tunic and an oversized scarf. I love these leggings because they’re high waisted and thick enough that they’re not see-through at all. I really tend to lean towards high-waisted jeans and leggings because I still have a pouch of fat on my lower belly from giving birth to Riley. I’m honestly not sure if it’s ever going to go away at this point but I’m not gonna stress about it. I just find that wearing high-waisted pants makes me feel more confident because the fat is contained. Ha! And these leggings are super affordable at under $30. And I’ve written about this white tunic before. It’s just a great basic to wear with scarves this fall. Or to layer with a flannel or chambray shirt. The best part about it is the length. It’s long so the back of it will cover your booty when you’re wearing leggings. My backside is not nearly the same as it was a few years ago so I’m definitely a fan of keeping it covered these days. And get this, it’s on sale for $27 right now! And I got my scarf a few years ago and there are so many versions of this exact scarf online. The one I got is only $15 and I got it here but it was a few years ago. I think this one is the exact same (lighting in pic is just different) but I can’t be 100% sure. But even if you just Google plaid scarf you’ll find a ton like it. And lastly, I am so excited to share that Børn has offered to give two pairs of Børn shoes away to two of my followers! One pair for you AND one for your bestie! This is all you have to do to enter. And the only other thing you have to do is comment below telling me what color Cricket boots you would want if you win! And if you don’t win, don’t forget to use my discount code ALILUVSBORN3 for 15% off! You’re going to love the boots! I love your outfit it is great for fall!! Riley’s overalls are sooo cute, I wish my boys were still that little! For boots I would say taupe in size 8. Hello love that they have my size ! Taupe suade size 11! Taupe size 8! Thank you! You have a beautiful family Ali. Good morning! I’d get the taupe Cricket boots for sure. I love easy, comfy outfits like this to get me out of my mom uniform (nursing tank and yoga pants!). Super cute! Love all of your posts and seeing how cute Riley & Molly are! I would love the boots in taupe size 7.5. I absolutely love this look! I just bought the white top from Nordstrom, its beautiful! I recently just had a baby and boy has my style changed too! I’m needing clothes that are comfortable and that move with me when I pick baby up. Love all your posts, especially about being a mom 🙂 You are very inspiring! So torn between the grey and taupe! I LOVE the taupe but I am going to choose grey because it won’t get dirty as fast! I’d absolutely love a pair of the taupe suede boots! They are so cute! I would love the taupe pair! Love this cute post!! I love your outfit ! It’s casual but classy i’m in love ! I would lové to win a pair of boots in taupe ! Taupe suede! Love this look and love love those boots! You always share the best options for outfits and especially good quality yet affordable! I love these types of effortless looks because they are comfy but also fashionable! I would choose the taupe! I don’t have a pair of boots in the color! You’re beyond sweet for always doing these giveaways for us and Riley looks sooo precious in these pics! Well your kids always look precious, so it’s no different haha I would love these in grey suede! Taupe suede! Love this look! Love all the looks and love the Born brand! I LOVE your blog and have purchased several items all due to your posts! If I was lucky enough to win, I would LOVE the taupe boots in a size 8! Hi Ali! I love this look for fall! And your kids are so adorable! the taupe pair are so cute and would go with so much! Thanks for the giveaway! So adorable! I would love the grey suede!! Love your outfit! I have a scarf that looks just like that, I love it! Hi Ali! Thank you for being honest and real. Sharing things that most women can relate to! I would love the gray ones in a size 10! Hi Ali! Love your blog! Thank you for doing these giveaways 🙂 I would love those boots in taupe. In love with the taupe in size 7.5! My best friend needs new boots and these would be perfect!! Børn are the most comfortable shoes and love them for traveling. Stylish and comfy! So my style guru, Ali, if I win I would love the beautiful taupe in size 10, and I will also tag my BFF once you have photo posted. Thanks Ali for all you do!!! Love the casual everyday look, very comfortable is always important. Loving this whole look! As a mommy to a 2 year old and 2 month old, Lord knows my daily look is yoga pants and a sweatshirt. This would be comfy and I would feel like a million bucks! I love the black suede in size 10! I love the grey suede!! So versatile. Taupe…. those are just divine!!! If I won I would love the taupe in a size 7! Love you and all your posts! As a mom to an almost two year old little boy and 28 weeks pregnant with my second little boy, I completely feel you when you say you like style, but comfortable! Busy mom life! This is the perfect fall look for me!! I am a first time mom with a six month old daughter, so I feel you with the mama pouch. I call it my “roo pouch” haha! You have a way of mixing great style but keeping the comfort level, which is hard to do! I love the outfit AND boots in the taupe. I would wear a size 10. I would love the boots in taupe! Loove the simplicity of this outfit! I would definitely go with taupe. Riley’s shoes are just too cute as well!! The grey for sure!! Love the look of these boots and would be great chasing my toddler😊 what size do you wear in the leggings?! The black boots are so cute! I would love to win a pair. It is so nice of you to do these give away 🤗 enjoy your day! Love your blog! I love the taupe in size 10. I love love love how effortless this look is for a busy moms. Your kids are so adorable. I would love the boots in Black size 7. Love the outfits in this post! As a mama with an 11 month old son I am definitely feeling the high waisted legging and tunic look. So easy to throw on and look put together. For the color of boots, I would go with taupe. They’re so cute and would match everything! Ali, I love following your blog and Instagram stories. The babies are so precious. The color I would want is black or taupe. And size 8 and 9 to share. These boots look so cute! I love the black ones. Hi Ali 🙂 Super cute boots! I would probably go with the taupe suede, size 8.5! They look so good on you! Hi Ali, I love your style it’s so cute & it looks so good on your. I love the taupe size 7, your family is sooo cute. I’m always going on your blog and looking at all your photos you post. I know I posted like 5 minutes ago but I put down the wrong color boots I wanted lol. Wow! Such a generous giveaway! They’re all so pretty. I think grey would be most versatile for me :). Since you rock those taupe ones, I’ll have to go with taupe too!! Taupe Suede in size 8! I love this ensemble, and the boots are gorgeous! 💜 Thank you for posting all of the details on this look, to take the guesswork out. We are all so busy these days. All of the colors are beautiful, but I would chose the grey! Hi Ali! Our boys are the same age 😍 I would loveeee these boots in the taupe color! Size 8.5! I LOVE the taupe ones!!! Such cuties! Love your post about Molly loving school. Hoping my 18 mos old will love it too next year! I’ll be using your tricks for sure. Not sure if my comment posted but the grey for sure! Love the style of these and too would be perfect chasing my toddler. I ordered these leggings when I saw you posting them previously. What size do you wear? I can’t tell if they are true to size. I’m 36 weeks preggo so I can’t tell if they will fit or will be too small after I deliver. Thanks!! Love you & the look! Taupe would be my color of choice. I would love the Taupe boots! Love your outfit. I would like to try leggings also. I’m all about being comfortable while still looking stylish! Boots – love the black in size 6.5. Thanks pretty lady! Ali I just love the photos of you and your cuties! Especially the one of all three of you! I totally know about having a baby that is in the 95th percentile or higher! My first daughter was and still is big for her age! She flies through clothes! You always look so well put together! I hope I can win the boots! I love the taupe! So perfect for fall! I love the color boots that are in your picture! After having a little one the stretchy clothing works best with breastfeeding! Your outfits are always so cute and thank you for sharing where you get them! I one day hope to be able to pull off these types of cute outfits!! Grey! And it’s my daughter I’ve nominated with me!! Your family is so sweet! Love the outfit and the boots. I’d probably do black boots but love the tan you have too! Sooo stinking cute… all of you!!! Love your outfit! Your kids are always so adorable! Love all the colors, but think the taupe would be great! Thanks Ali! This might be one of my favorite outfits of yours. I love this new style of yours because it’s so accessible for my lifestyle as well. I’m a nurse and live in scrubs most of the time and when I’m not in scrubs I want to be just as comfortable but still look cute. I would get the taupe suede boots because they would go with everything! I wrote in but didn’t see my comment so trying again. This is a fabulous casual ensemble, and I would love to have the grey boots! Good morning! I love this giveaway and would love to win these beautiful boots for fall! Taupe/ cricket in size 6.5 would be wonderful! Waking up to your posts is always one of the best part of my morning ritual! You always manage to put a smile on my face. love that your giveaway also includes a friend! I would love the boots in taupe size 6.5. I would choose the black suede boots! Thanks Ali for being so awesome! Psst…I needed new leggings and based on your blog, I ordered 2 of the high waisted ones you raved about! Grey suede. I’ve been dying for a good pair of grey boots for two winters now to replace my frye boots that I completely wore out. Love the outfits, they’re put together so well! 😍 for me, the taupe in size 8.5. You are rocking the taupe suede boots!! I think the grey suede color is my favorite though! Wow, lots of comments! I never win anything but this would be super cool! I’m a size 8 and I’d like black! The other pair would be for my babygirl, Hazel. She’s a size 4 in infant (she’s 18 months). Any specific shoes from them you’d recommend? She wears down ALL her shoes, she runs around EVERYWHERE. Good luck to everyone else. Love reading your blog also Ali. I’ve followed your story since the very very beginning! This is the cutest MOM outfit 🙂 Love what you said about the calf width of the boots. The Taupe are perfect. Thanks Ali!!! Make it a great and awesome day!!! Black suede! Size 9. Love !!! Hi Ali! I love your blog and all of the cute stuff you post! I would definitely do the taupe color you have on in your look! The whole look is absolutely my style! I’m currently pregnant and find it hard to feel cute without spending a bunch of money on new clothes! But that Tunis is something I would wear every day too! I love the casual but cute feel. I am a daycare teacher and chasing kids around daily is my life. So those kind of outfits are what I go for! Your outfits are always amazing!! Would love the grey (size8) if I win. Love the outfit! And Riley’s outfit is just too cute! I love your blog andyou’re always so down to earth!thanks for being you! If i won I’d like taupe boots in 8.5. Love love love the scarf!!! Fellow Mass girl here and the weather is just calling for boots!! Good morning! I’ve been eyeing one of those scarves for a few years now, so I think I might bite the bullet and get it, especially since I will be carrying a newborn around myself. I’ve always admired these bots from afar, I think I would go with the gray since I have a black and tan boots and booties and I don’t have any gray shoe items. I got my leggings picked out for postpartum so I’ll probably be dressed in very similar outfit for the next few months. My fab colour is the the grey suede boots! So nice!! Hello Ali!! Love your outfit today! Would love to win a pair of boots. Taupe or dark brown would be great. I have small feet so I’d need 6 or 6 1/2! Thanks for running another great contest, Ali! Do we both have to get the same color? My bestie would like Taupe, and I would like Black! Perfect for the Fall weather in the Berkshires! Taupe for sure!.. love your blog! Hi Ali! You guys are too cute! I love following you (and have been for a long time) because you’re such a positive and REAL role model! Thank you for always being you and bringing us all along. Would love the taupe color! Hi Ali, love your style and think this would be perfect for a expecting mama like me! 4 months preggo and looking for a perfect fall outfit for our babymoon to NYC! Would love the color you have in your pics (taupe) and size is 8.5.
also, do you think those leggings would be good maternity leggings? Good morning!! I would want the taupe boots size 9. I love reading your blog and all of your Instagram and Facebook posts! You are so sweet and so down to earth and real! I love how honest you are about your life and share things so openly! I would love to win a pair of boots for my bestie and myself! I would love the grey suede in a size 7! Riley’s overalls are adorable! Your kids are so darling! Your outfit looks amazing on you! I totally need a pair of boots! Mine are all beat up and I rarely buy myself stuff as a mom of four (7 yo and under)! I’d love any color in size 7.5! Surprise me! Ali, love your style! So cute!!!!! I already have the top and leggings now I just need the boots to complete my look! I would love the taupe. Hi Ali! Love your style, blog and reading about the family. I have a little girl born just a few days after Riley . Thanks Ali for all your styles tips!! Love, love them! For sure would love the taupe boots love that they are not heels so I could chase my kids around. I always love your outfits!! I’ve been looking for boots similar to this style and just can’t find any that I’m in love with! If i win i would love the taupe size 7! Hi Ali!! Love your blog! I would love the black boots in a 6.5 🙂 your little babes are so cute! Need new boots for fall/ winter. I teach kindergarten and mine are so worn! Taupe 7.5 please!!! Such a cute outfit! Love your mom style! I say taupe for sure – so versatile! Hi Ali! I love your blog and read it every week 💕 you are so inspiring! I would love the Taupe Suede in a 7 1/2, my friend I tagged is My friend Yvonne, she loves boots also and since I have plantar fasciitis Born is the most comfortable shoe for me, so I hope I win. Such cute outfits! Your boots look so cozy yet chic! I’d love them in taupe and I’m a size 8 1/2. Love your outfit! So cute! I would choose taupe boots, and get something similar for my little one!! If I were to win the Born boots, I’d be lucky enough to get the taupe in 6.5. And a pair for my 1.5 year old daughter who is on the go!! Hi Ali! My sister and I both love your blog! Black in size 8.5 for me! Fingers crossed!!! Love this look! 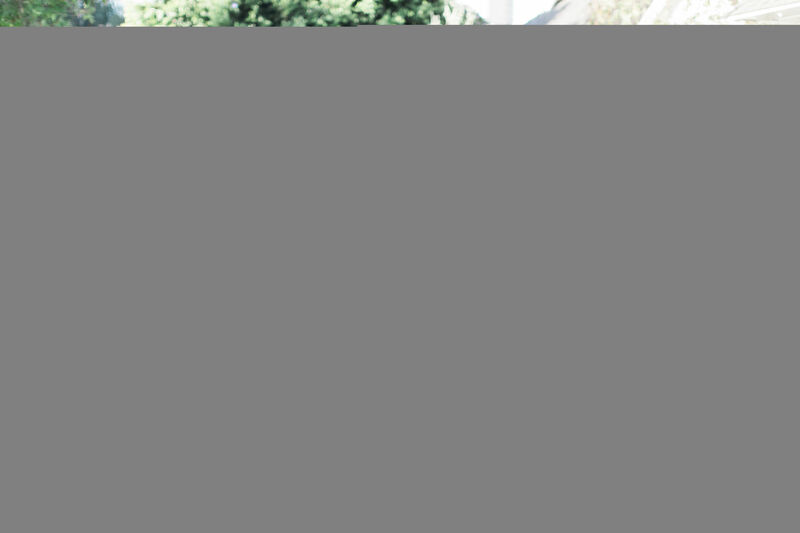 It’s so refreshing to have a blogger to turn too who showcases affordable fashion pieces! Always love turning to your blog for fashion advice. For the boots, I’d go with black in a size 9. Loved reading your post 😊 thank you for sharing! Love your style and your posts! Always so real❤️ I need those overalls for my little man so stinkin cute! The boots in taupe would fit my wardrobe perfectly! Thank you for the chance to win + for a loved one. I would love to win the taupe suede! I’m due in 7 weeks with my first baby and I’m ALL about the comfy shoes these days! Ugh I have been a diehard fan since day one! It would be amazing to be chosen!!! The taupe is my favorite but beggars can’t be choosers so whatever is available, I would be happy to get! Thanks for sharing Ali!! I would choose black. I absolutely love your look here! Easy to throw on and go and I love that boots aren’t super high! I just can’t do high shoes anymore! I love the taupe suede in 9.5! These would be perfect for me and my best friend! We are both pregnant and only 5 days apart in our due dates! Comfy boots are for sure a must! The taupe would be perfect and match pretty much everything! Absolutely love your blog by the way! I adore the taupe boots! So cute! I absolutely love following your blog! Your realness, passion, and kindness are contagious! My sister and I would adore these boots! Hi, you and your family are adorable! Thanks for sharing your family with us 😍 …would love the grey boots in a 8 1/2. You look so cute in all your outfits! Molly and Riley are adorable. I would probley go black but like taupe color too. My favorite boots just broke !! I would love the taupe boots for chasing my little ones! Hi Ali! Awesome giveaway, thank you!! For the boots I would love taupe in size 11!! Good afternoon Ali, thanks for another giveaway and your blog, though I’m thr mom of 3 ages 24, 16 and 14 I still love reading tour blog for the memories, and your fashion tips and style which I have non of 😂 so thank you for that. Your blog still gives me a great insight into parenting and to be able to help with advice for friends on how things are done today. You are an amazing mom keep up the fantastic work and thank you for all you do!! I love the taupe color! Grey 💕 -I want all three colors! Love them! LoL oh I forgot to say I would pick taupe in either a 7/12 or 8 thank you again!! I’m a new mama and I love this outfit! (As I pick spit up off of my shirt that I didn’t realize was there!) that tunic is great and so are those boots!! Taupe in a size 7. These boots are just gorgeous! I would love grey suede or taupe!! I could see myself in a comfortable outfit like this. I’d choose taupe in 7.5. Hi! I’m a new follower and am loving your Instagram page! I, too, had a date night this weekend, which happens like twice a year! 4 kids make it tough to get out. I noticed how uncomfortable my black boots are so I’d love a new pair of black boots in a 7.5! As a mom of two under 2 (big sister & little brother), I really look forward to your posts and stories. I find them so relatable and they truly give me so much inspiration! I love how real you are and commend you for being so honest and brave in the spotlight. Thank you!🤗 Your style is equally as amazing, and I am obsessed with these boots! The taupe color is so great for fall! Lo w your giveaways and would love the boots in taupe, size 7.5. Keep up the great work and cute outfits. Hi Ali! I would love these to be my first pair of over the knee boots! I’d also get a cute pair of boots for my niece if I won! Would love those boots in black size 8.5! Thank you for being so real! I’d love a pair in taupe suede! Love your posts so much! I’m a new mama and love your outfits! (I actually just picked off dried up spit up off my shirt that I didn’t know was there 🤔🤦🏼‍♀️) I’ll be ordering this tunic! I love the taupe boots!! Great boots!! I would like the black. I love these boots!!! So cute and easy to dress up or down!! Love seeing your post with the kiddos. Love this look! As a mom of two, youngest being 8 weeks, I can totally relate on the style change. Mine probably changed after I had my first, but I still want to look put together and cute so this outfit is perfect! And I have longed for these boots ever since you did the giveaway last year. I would definitely want the taupe color. Thanks for doing this! LOVE you. LOVE your style. LOVE your little family. And LOVE this blog! I would love the taupe. The color looks great with your outfit! These boots are adorable and I love the taupe ones! I would also love to win a pair for my son also! He was just born Wednesday so the planner in me wants him to be all set! Hi Ali! I absolutely love your style. I would love the taupe color. Thanks for doing this giveaway! I love reading you blogs and seeing all your fashion tips! I like the taupe boots! Hi Ali! Love your blog and seeing pics of your beautiful family. I have a 2.5 year old girl and almost three month old boy so I love reading all your mommy tips. Love the boots and have the leggings and tunic in my Nordstrom cart! Love born boots, SO comfy! Have a pair of their booties, perfect for teaching all day! Love these OTK boots in Taupe! I love all your outfits! Even when your in your jammies 😂 also your daughters clothes! Too cute. Such a cute outfit and family!!!! I am loving the taupe in size 9!!! These boots are amazing! Thanks for offering this giveaway! I would love taupe suede! So versatile! Thank you for doing these, Ali! I love the taupe suede!! 🙂 size 8. Ali I love your blog and posts! Molly reminds me so much of my daughter when she was her age and now my Ashley is 24! Enjoy every moment as the time truly does fly by. I tagged my daughter because we love to shop together and we chat everyday. We truly are Besties!!! Thank you so much for just being You!!! Love your outfits and I love that you post where you get them from and when you get great deals it shows how down to earth you really are. I would love the boots in black size 9.5! P.S I admire you so much for always being so open about things that many women think but don’t feel comfortable talking about & for also always wearing your heart on your sleeve. Good morning! I’m a new mama to a five month old baby boy also and am still trying to figure out how to dress my body after baby. I look at all of your blog posts and have bought some pieces you recommended and couldn’t be happier! I live in the Caslon t shirts from Nordstrom’s so comfortable! I could use some new black boots so the black suede would be perfect! I’d get the taupe boots. Those are the cutest boots! I love the Taupe color!! You look so effortlessly cute. I would love the grey boots! Thanks for doing another giveaway!! You’re the best Ali! Love this giveaway! I am always looking for boots to fit over big calf’s!!!! Love your blog and following on instagram!! I tagged my mom because she loves boots and following you as well! I love taupe suede 10 and my mom black 10 as well!!! Thanks for the awesome give always!!! You make being a mama of two look so easy!! I’m a first time mama to a beautiful 2 week old baby girl and could totally use some new boots!!! Would love the boots in taupe in a size 8 – may have to go snag them for myself for my birthday today if I don’t win!! And Molly’s dress being too big doesn’t look silly at all!! I buy my girls dresses big all the time…. the more wear we can get out of them, the better!! LOVE LOVE LOVE ALL YOUR POSTS!! Taupe, size 7 1/2! Ali, I love your blog and I love this post! I am the mom of an almost 2 year old and I work full time, so I totally understand wanting to be comfortable and stylish. I’ve been trying to find a happy medium with my wardrobe so that I don’t have to change when I get home to play with my daughter. These looks are inspiring! I would love to win a pair of the taupe boots…so cute! I love reading your blog and following you on instagram! I had a baby around the time you had Riley, so I really appreciate your styling recommendations! It’s a little tricky to find clothes that are comfortable, and fashionable! You take the guess work out of it! Thank you! Those Born boots are beautiful. I love how you styled the taupe. So much so I would go with the Taupe in 7.5. I love the Taupe. But if I win I would love for my nephew to receive the shoes for his 2 kiddos. Going through a hard time as his 14 month just diagnosed with neuroblastoma. Hard to choose between taupe and gray, but I think I love the taupe! 🤞🏻🤞🏻🤞🏻🤞🏻 I’ve never won a giveaway before, so hoping for this to be the one! I am a size 8.5 Taupe! The taupe is so cute! I agree about keeping kiddos in shoes even if they aren’t walking yet… seems necessary and they are obviously super cute! I love the outfit you are wearing today! Classic and cute! I would love to win the boots in black size 10 and one for my bestie too who lives across the country! Hey there Ali. I have loved you since #bachelornation! I enjoy how you blog from family to fashion to health and all things in between. You inspire this single mama daily. So shouting a big THANK YOU and tons of luv and support from this little town of Wetumpka, Al. Size 6.5 and Black would be my choice. I would LOVE the grey suede. I adore this whole outfit!!! Love this look! Very functional and cute mom attire! I LOVE the grey cricket boots! Love your outfit and the way you are with your kids. Those cricket boots by BORN are so cute- id love to win the Gray Suede in a size 9. Ali I seriously love you and your little family. As a young mom I’m always doubting myself and questioning if I’m doing a good enough job with my son (he will be 2 in November). Your real life posts make me see that every mom struggles and it’s not always what it seems on social media and I love that you are doing that! You’re a role model to me and my other mom friend (tagged her on your post) and I can’t tell you how much your posts and blogs help me with my confidence as a women and a mother. ❤️ Keep doing what you’re doing because you’re helping women and mothers probably more then you’ll ever know! I love the taupe suede! Thank you! Such cute boots. I love the taupe, size 6!! I’d love to try over the knee boots! The color you’re wearing, taupe suede, looks amazing! Thanks for doing such fun giveaways! New mamma here and her best friend would love a new pair of boots. I haven’t had a new pair in 3+ years! Taupe suede please! Hey Ali!! You’re blog is always so real and honest. Thank you for that! For the born boots I would 100% go for black suede. Who doesn’t love a good black suede boot to dress up the everyday outfit! Hi Ali! Love your style and the cute outfits you dress your kids in too. I have a 2 month old little boy named Lou so I especially love getting ideas from Riley’s outfits. I would love love love a pair of the taupe cricket boots. They look like they would go with anything and be perfect for the fall! Hard between the gray and taupe, but I think taupe, size 9. Love this outfit! I would like taupe in size 9.5. Thank you for doing this great giveaway and including someone we love-great idea! Taupe Suede – what good looking boots! After giving birth on 10.5 it’s definitely time to get out of maternity clothes and start wearing some fun Fall outfits. You boots just like the ones you have on cause they are fire! Size 9.5!! I’m not a mum yet but I am a full time nanny to 3 kiddos and I have twin nephews and also a niece and spend the majority of my free time with them! I still want to look cute ofcourse but runny around after all those kiddos I also need to be comfortable,so I love this look you have on! I’d love the boots you have on in the photo in a 7.5 or an 8 🤦🏼‍♀️ Usually I’m a 7.5 size but sometimes in boots I have to go up a size to get my feet in. I would love for my bestie and me to have a pair of these boots. I would take grey size 11. Love your style and your honesty!!! I still have my pouch 13 years later. oh my gosh these are beautiful! But I think my favorite would be the taupe suede so I can get away with brown and black! I love watching you on home and family and I love just as equally much your blogs and your stories on Instagram of your beautiful family and home ! Taupe suede, size 10! This is such a classic outfit that you could wear over and over, and those boots are amazingggg! Hi Ali! I would love a pair of the taupe, size 9.5!!!! I would love the grey ones!! So cute! How do you beat the look of the taupe boots?!? 8.5! Love all your fall looks. Keep slayin mama! I’d love the boots in Taupe size 8! Always love reading your posts and watching your Instagram stories! Hi Ali, you are as beautiful as day 1 from the bachelor! Molly and Riley are so blessed to have great parents in you and Kevin. I listen daily and follow you both on Instagram! The boots would be for me and “my baby” shes 17 graduation next year heading to NAU. Both size 7 and both in Taupe! I love the Taupe suede color! I would like the taupe in 8.5 please! You have no idea how much I want to win this giveaway!! Thank you so much for the opportunity. I think I’d pick gray. But I don’t know, those lighter ones are killer … I think I’m going to have to pick the lighter color. I love your blog and your insta videos! Grey suede 8.5 for boots!! Gorgeous boots! I’d love the black, size 9.5. Thanks!! I love the black bow hair accessory! So cute to dress up a simple pony tail 🎀 if I were to win I would pick the taupe since I don’t have any that color. Also they would go with everything! Hi- I would love the boots in a 7.5 and I’m taupe. Happy Fall! You always look so good, even when you say you’re tired. Boots might just brighten up my day …. i would love the taupe, size 7. Love these boots. First time mommy to be in a few short days!! Always looking for fall looks that I can throw together quickly and still feel put together. Those first few weeks I’m sure I won’t be put together but having these boots would make getting that way a whole lot easier!!! Would love taupe size 8. Taupe boots go with everything :). Taupe! So cute and versatile! I would love the taupe in size 9! Love this outfit and your blog! I have a boy who is a couple weeks older than molly, and a 6 week old boy too, and this is also my go to mom outfit! I love that you’ve been keeping things super real lately on IG and on your blog. You’re awesome. What beautiful boots! In the North East it’s starting to feel like Fall. I just had a baby last week and ordered every item of this outfit because I already feel the need to look good while still being comfortable which is not easy with the belly still lingering. I really appreciate your help with this look! I’d take any color but since I already have the rest of your look I should probably complete it with the taupe color. Hi Ali! I love your outfit. I actually just bought the leggings on your recommendation and I LOVE them (I just had a baby also in June and they are perfect to hide my tummy). Thank you! Hi Ali! Loving your look and Riley’s, of course! I’m a super fan of you and your hubby’s. Love you both and all you teach/preach. I get it, Kevin, less sugar! 😉 Would love to win the gray suede! Hi Ali! I love this whole outfit, and I love that your ponytail ties the whole thing together. I love looking at your blog to get ideas for fashion! I would die for a pair of these boots. I had a really well made pair of over the knee black boots that died last season 🙁 I am hoping for black in a size 7! Thanks! So cute!! I would love the black in 7.5! I’ve been following you for a while now and love your style and choice of stores (my fav is Nordstrom too)!! I bought the born loafers in tan back in the spring and wear them every week to work! I also got my friend who I tagged on your instagram to buy the same pair!! I love the boots you’re wearing in this pic so I would love the same color in size 8.5!! Love this post! Gave me some inspiration for a classic fall look. Hi Ali. I would love the boots in grey in a size 7. I would love taupe size 9 in the boots. They look like a perfect fall boot, love a wide calf! Fall is my favorite fashion season. So cozy and cute. Hi Ali!! I love the taupe color!! Taupe boots in size 8.5 !!! I would love to win a pair of boots, size 6 in black or tan. Love these boots and this outfit! As a new Mom, I completely agree that functional outfits are key!! Hello Ali! I would loveeee the color Taupe Suede!! Thank you!!! I have always loved your style, pregnant or not and I adore these boots! I love your style Ali ! The kiddos are the cutest little siblings! I would LOVE Born knee high boots in black size 91/2! Love this fall look!! And love seeing your cute looks for Riley… my little man is three months on Wednesday and I just love all the teen clothes for him!! I would get the Taupe in an 8.5 and would wear them to teach in all fall and winter long!! Hey!! Love you and your family 💕 cutest ever! Such motivation! Thank you Ali! 8.5 in taupe wide shaft please! My bestie and I are always twinsies so these would be great! 👢👢👭😍😍. I love your blog, it makes me so happy and puts me in a good mood every day! Lots of luv!!! I love the Taupe! Such a cute outfit! Seriously the most perfect outfit. Especially for all the family photos coming up! Taupe would totally become my go to! Size 7! Hello Ali!💕 Cute outfit. I love the boots and I would choose the grey size 8! Love the look! I’d want either grey or taupe in size 7. Love your blog and boots! I’d love them in taupe! Just got home from work and am so excited about these boots! I’m a size 8.5 and would love the gray. Super cute boots! I would LOVE the taupe in size 9.5! I need a good pair of black boots! These would be perfect! Thank you for the giveaway. Hi Ali! I am a newer mom, and I love hearing your story. I loved your interview recently on the Babes and Babies podcast as well. I would love a pair in black size 8! 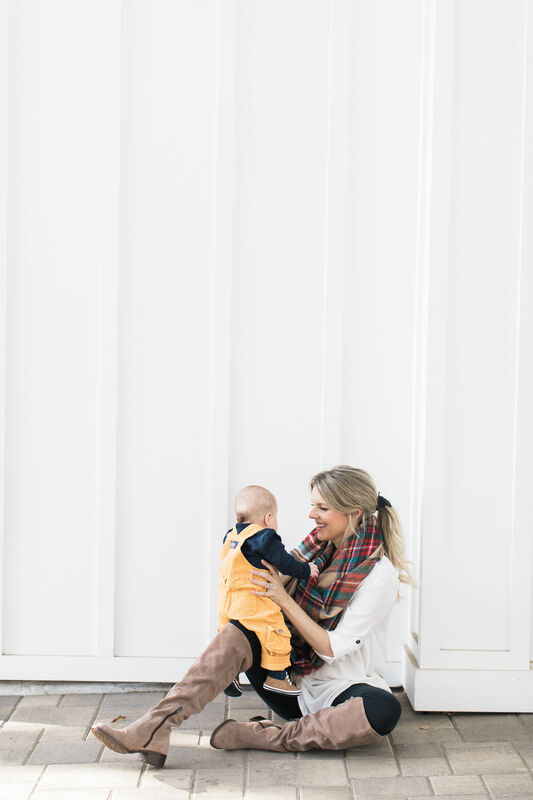 I am a mommy of one who definitely needs some easy outfits! I would love the grey ones! Love this outfit, especially the boots. Taupe, size 8. Love the taupe also!! So versatile. You’re the best! Love all your styles! I would love Taupe size 8! This outfit is so cute! I can’t wait to recreate this with what I’ve got in my closet. Only thing I’m missing is boots! I would get either a black pair, or seeing the Taupe ones on you makes me want those! I loveeeee the Taupe boots!!! I love these boots!! I would love them in a 7.5 taupe!! Already ordering the rest of your outfit cause I love it so much! Any color size 9.5!!! Love them! OBSESSED with these boots! I NEED the taupe! So cute! I’d love the taupe in a size 9. I love the whole look, but especially the boots! I would choose the taupe color. My feet grew from pregnancy and none of my shoes fit so I would love to win these!! Taupe size 8.5!! Hi Ali, luv luv this look and your kids have the nicest footwear! Love all three of your guys outfits! So cute! Love your posts especially for super cute fall stuff for my little girl around Molly’s she and myself. Our babies are just about a week apart I think. I can feel your foot pain, literally. The taupe suede you have on are PERFECT. Not too dark for darker outfits and keeps a light tone through fall and winter. Love! I wear an 8.5. I would love the taupe boots! 👢 I love this outfit. 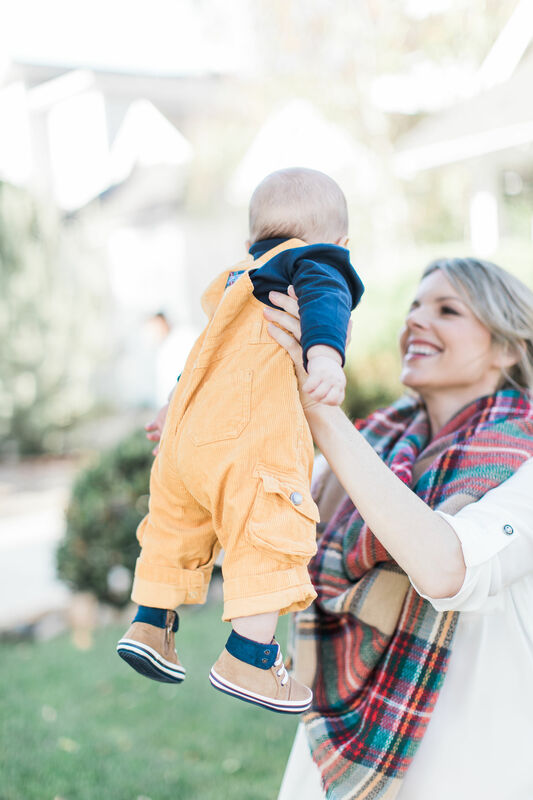 I love your whole look (and the kids too) and I just so happen to be in the market for some cute new boots. These look perfect. I really like the taupe color. Love your posts! Taupe boots size 9! I love the taupe size 7 ❤️ I’d love to win a pair for one of my boys!! Grey size 9 please!!! It’s so hard finding wide calf boots so I’m so excited!!! I love your blog and you have really I inspired my wardrobe! I would love the taupe if I win :). My friend and I are both new moms with our babies 9 days apart! I love how honest you are about motherhood! I would love the boots in size 6. Taupe. Love your entire outfit and you! I’ve been looking for boots just like these! I love the Taupe color! Perfect for fall! I think I’d go for grey! With two, two and under, I’m also all about comfort and easy outfits. I’d love black! I would want taupe in size 8.5! Taupe!!! Or maybe charcoal. How can I decide? I would love the Taupe size 9.5! Taupe! 😍 Always looking for a good neutral fall boot and these look perfect! Thanks! And I love reading your blog! 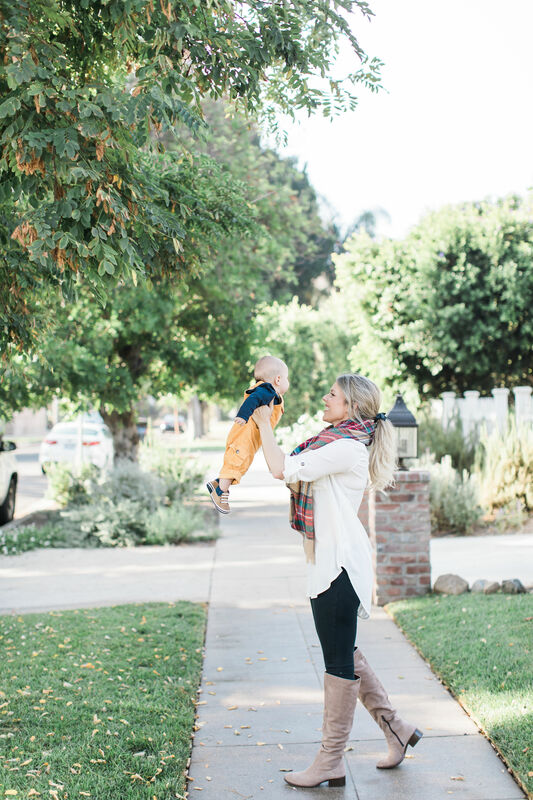 Perfect fall mom outfit! Comfy, cute and easy! I’d love the grey boots, super cute! And I’m glad to know they have kids shoes, too! I love your blog and how honest and down to earth you seem. You are really inspiring! Thank you for being a great role model for women and young girls! I love the taupe!! And I definitely need that tunic in my life. (I feel you on that after baby rear end thing)🙈🤣 Thanks for all the great style advice. Would love the grey suede in size 8. Super cute and Born is so comfy!! Hi Ali! I thoroughly enjoy seeing your sweet children and your uplifting IG stories along with your blog posts!! ☺️❤️ I also truly appreciate your authenticity and your genuine sense of self in your stories and blog posts (especially since we all know life is not perfect!). Btw Born shoes are pretty much the only shoes I buy now!! SO COMFORTABLE!! If I were to win the giveaway, I would choose the Born Crickets in Black size 9. Look forward to hopefully hearing from you! Oooh! Love the black size 6. Love seeing you daily and the beautiful babies! I think I would go with taupe as my first choice and black as my second! You so inspire me!!!! Not only because of your amazing style and attention to detail when it comes to fashion but also because of your positive attitude that comes across through your posts!!!!! Love the outfit!! Also love how real you are! I enjoy following your blog especially since my son Owen was born a few days after Riley and I had polyhydramnios as well and was induced. It’s comforting to see the journey you are on and keeping it real!! I would love the taupe! Taupe is such a great staple color. Size 8 please. I have that top in multiple colors it’s that good! Your family is beautiful. Thanks for the giveaway. I absolutely love your style and have been and fan since you were on the bachelorette!! I would love light or dark brown boots if I won! 😍 Such a fun contest!! Love this entire look! We’re getting ready to do fall pictures and this outfit is exactly what I had in mind. Love these! Just moved to the East Coast from Texas and I’m going to be needing all the warmth I can get! Hi Ali! These pictures are adorable! I love your style. I would absolutely love the taupe boots! Would love the taupe! They’re beautiful! OMG!! I love them! Grey Suede size 6.5 Please and Thank you. Hi Ali! I would love the taupe suede in 6 1/2. My bff, @olivekona is a 9 I believe, but don’t quote me! 😅 thanks for this opportunity to win a pair of these amazing boots! I would love the black boots in size 8.5 super cute and could wear with everything! Love the taupe in size 8! Mom of 3 young boys here- would love these fun boots! Thank you so much for all your awesome posts! You’re so incredibly generous to do give-aways too! If I win I’d love a pair of the boots in Taupe and would give the winning with my sister!! I love the taupe suede ones you are wearing! Taupe in 9!!! I’m a mommy of three (5, 3.5, and 8 weeks) and am in desperate need of updating my style! These are great! I would love the taupe in size 10.5! Okay I am zooming to buy that top! I just had my 3rd baby and I swear this outfit will be my uniform. I would love a pair of the Born boots in Grey Suede. Born is such a great brand, I would be thrilled to own these! I love love the Felicia tobacco distressed! Size 6.5. Hi Ali! If i were to win the give away i would LOVE the taupe boots in a size 6.5! Love this outfit for fall! I am obsessed with plaid scarves! I am a mama to a busy 3yr old boy and functional legging outfits are a must have in my wardrobe! I’d want the exact same ones you have on! So pretty! I would LOVE the Taupe in a 7…maybe 7.5 depending on fit! ❤️ Thanks for doing this awesome giveaway! I like the color you are wearing in the photo. Molly and Riley are absolutely adorable and I love love love seeing pictures and videos of you all (and your outfits which are always so cute!)!! 💕💕 I would love the Taupe suede boots in size 9… crossing my fingers for a win. 😄 Thanks for being so sweet! Taupe Suede. Such a cute outfit! And so affordable! May I ask what sizes you are wearing in the leggings and tunic? Ali, your such an awesome example of “how to do it all”! Love your kindness, positive attitude and honesty! Cheers to a lovely holiday season! Ps. I’m loving the gray boots! Your family is just beautiful! 💕 I adore these boots and would be so happy to receive a pair. I love your style, Ali! I come here when I need some outfit inspiration:) I’ve been looking for some black over the kneee boots and these would be prefect! Great outfit choices as per usual. Love your “momma” style! I would love the Taupe in size 8.5! Ugh! I’m in absolute love with these boots! I would love to have matching Taupe boots with my sis! It’d be like we’re little kids all over again haha! For reals though these boots are so cute! Grey in size 9! So cute! Taupe size 8!!! So cute! Loving the Taupe on you! That’s a color I don’t have. Would love them in a 6!!! Ali, you and your sweet fam are adorable!!!!! So cute…the little one, you and your outfit! Ali! We (me and my daughter) love your stories and love following you!! We watch you and Kevin’s videos everyday! My daughter is just a couple months behind Molly! And a little boy on the way! Thanks for making being a mom real! So so cute, your outfit and the little ones! First, congratulations in becoming a mama bear to two very cute little ones! Also, thank you so much for sharing your life stories and how you get through your day to day! Answering all these comments must be a full time job in itself I would imagine…so “high five” to you for being such an involved mom as well as working as hard as you do!! Thank you so much! All of your readers love it! Thanks for doing a give away! If I win, I would love the taupe in a 6.5. Keep doing you lady!! You’re killin it!! Love that these are comfy! Being a teacher, definitely love the stylish and comfortable shoes! The Taupe would go with everything!! Love your easy Mom style and your honesty! Taupe size 9.5, love Born boots! I would love to win the boots in Grey Suede size 7.5 – super cute!! Ali, Always Love all your Instagram stories and how you show the world what motherhood is like in real life. You’re so down to earth and you’re fans love that! The taupe ones are beautiful!! I just ordered that tunic and leggings from Nordstrom! I can’t wait for them to come in! I hope it looks as good on me as it does on you! As for the boots, love the taupe! Love your Blog and your IG! Very inspired by your fashion style and encouraging words. When you were on the Bachelorette, the elephant necklace you wore by Alex Woo, I purchased b/c I fell in love; thank you. I hope to win to share the boots with my daughter. If I do, would love the taupe in an 8. Hey there! Black size 8. Too cute! I would love taupe in 9! I love your cute little family! I would get the gray, size 11. I would love taupe size 9 😍!!! Please pick me! I’m a new mom to an (almost) 8 month old and need a fashion pick me up. Black suede size 6.5! You insta and blog are so inspiring! Love seeing Molly grow it makes my day. She is soo smart and love watching her in your social media stories. Also, enjoy learning something new from your content every time (even though I’m not a parent yet. I love the taupe color, plus it’s a little different than the usual brown that i already have. Love the look! Definitely taupe- they are gorgeous. I follow your stories and appreciate a peek into your parenting. Our kids are the same age. I have a 2 year old boy who is off the charts in weight and height and a dainty 4.5 month old girl. Hands and hearts are full! taupe suede. Hope me and my friend win!! Thanks for doing another giveaway! I love those boots!! For the boots I would be a size 6 in the Taupe color! Your family is just beautiful! 💕 I would be so happy to receive a pair of these boots. Love this short! Have it in 2 colors. What do you wear under the white since it’s a little see thru? Adorable outfit! Loving the fall weather! I would love the black cricket boots! Any color! Would just be grateful to have boots in size 11 that are comfy for teaching! Thanks for being such an incredible bucketfiller, Aly!!!!! Grey would be my fave! Thank you for so many affordable outfits! As a nursing mother, I really enjoy reading your blog. I’d love the Taupe color if I’d be lucky to win it. It’s so hard to decide between the gray and the taupe, but I think I’d go with taupe because they’re different than anything I already have. Size 8. Thanks for offering this awesome giveaway! Love the taupe suede! By the way been reading your blog since my first pregnancy. It’s funny we’ve been pregnant at the exact same times so I’ve loved reading about your parenting experience as well as getting great style tips! Love the blog and the boots! Love the taupe and gray! Hello from Vancouver Canada, Ali!! Love the taupe in size 9!! I love the taupe in size 7 1/2- maybe just because you make them look so cute with your outfit because I always lean toward gray and black! They are all super cute though!!! Love your outfit with these boots! Would love to win the taupe pair size 9. Thanks Ali!! And I love following you and your sweet family on IG!!! Hi Ali!! Thanks for the giveaway days!! Aw, this giveaway is awesome! What a great way to celebrate friendship and cute boots! I would love the taupe in a size 8. Thank you, Ali! You’re so amazing Ali! Sure a good heart and loving spirit. You brighten my day, seriously. That white top is so cute – I may have to get that, too! I would love the taupe suede in a size 9. I would totally want these in the color your wearing! Taupe suede goes with everything! I love the way your paired it! Since my foot has gotten bigger since having my little boy I need some new fall boots! LOVE this outfit and would LOVE to copy it with a pair of taupe suede size 9.5!!! The boots in taupe suede size 9 would a perfect addition to my closet! Love these boots. The taupe color is gorgeous! Thanks for the chance to win! Super cute boots! Would lobe a black pair in size 10. Grey boots please! Thanks for doing all these giveaways! I love it! Love this look and love your style! I love your style! It’s definitely been more of a challenge to find cute, comfortable clothes since I had my baby but you’re blog has helped me find great deals! For the boots I would love a size 10 in taupe! I love your blog and your adorable style! Thank you!! Love the look! And absolutely LOVE Børn shoes!! Black would be my go-to. Definitely the grey in a size 8! What a beautiful pair of boots! Ooh I’ve always been a big fan of Born shoes! They are so comfortable and cute! I would like the black in a size 9. And I love all of your posts!! Ali! I would die for a taupe size 6! Thanks for always taking care of your readers! I love the Taupe color! Size 6.5-7 Such a great color for fall! My bestie would love the same color! If my daughter and I could win the taupe suede boots, that would be freaking awesome! Love watching the stories with your kids! Hi Ali! I love reading your blogs every day! I have twin 4 year olds who love to watch Molly and now Riley on your insta-stories. I would love to rock a size 8 taupe and my girls especially would really like to rock the fashion of little Molly! I would love the taupe color! I love the taupe ones!! I’m not there yet with having kids (getting married next year!) but seeing your beautiful family makes me excited for the future 🙂 thanks for always being such an inspiration to girls of all ages and stages of life! I would love the taupe color! Going to be a new mom come February so I need to get started on buying comfortable and casual clothes that look really cute. Love your style. I would love the taupe color. I will be a new Mom come February so I need to get started on buying comfortable, casual, and stylish clothing. Love your style. Taupe in a 10 would be amazing! I love this look! So simple, yet so stylish! I’d choose the color taupe if I won! The grey crickets are 🔥 love them all! I want to wear this outfit ALL FALL LONG!!! I love everything about this cute fall outfit! I would love the boots in Taupe size 7.5! I would love a pair of new black boots! Size 9. Love these. I would love to win taupe 8! Hi Ali! Absolutely all your blog posts! Both of our kids are close and age so I can relate to you in so many ways. Keep doing YOU, this mama sends lots of love and support. Dang, just commented all about how much me and my sis would love these and forgot to pick a color!! We love the taupe. Thanks Ali! Good morning!! I would love to win the Born boots in Taupe! 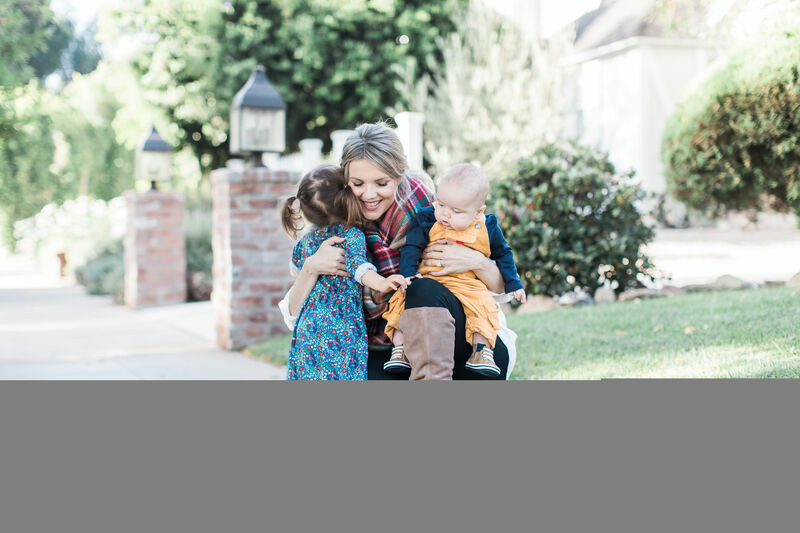 Your style is always super cute and great for mommyhood! Thank you for this fun opportunity!! !